Slater High School Senior Elizebeth (Beth) Johnson was recently named as February's AAA award winner. The award is sponsored by Exchange Bank of Missouri and was created to recognize students who are excelling in Academics, Athletics, and Activities. 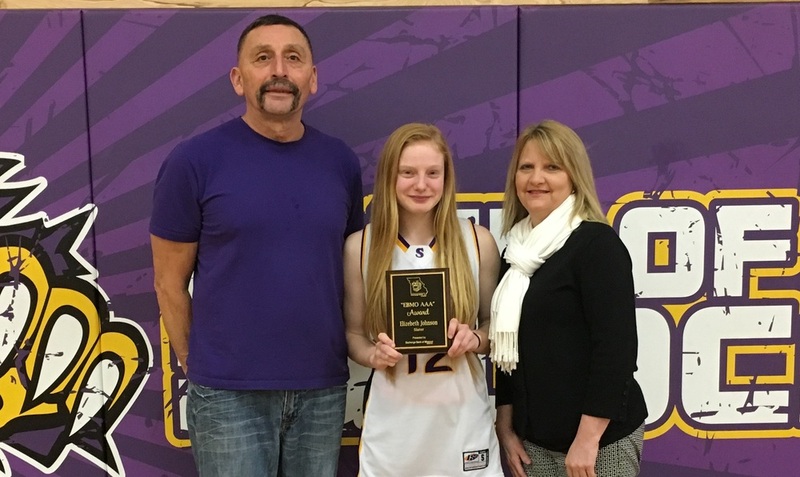 Pictured with Beth are Slater School District Athletic Director Bob Gonzalez and Kim Griffith of Slater's Exchange Bank of Missouri. Throughout her High School career, Beth has been involved in: S Club, Pep Club, Pink Week Committee, Basketball, Softball, Track, Cheer, FFA, Choir, Senior Trip Committee, and A+. She has made the Honor Roll every semester and was recently awarded the National Army ROTC Scholarship. Beth is the daughter of Jake Johnson and step-mother Jessica Johnson and the granddaughter of Mary Kay and Alan Adkins. She plans to enroll at the University of Central Missouri in the Fall and will major in Aviation Management/Flight Operations with a minor in Military Science.